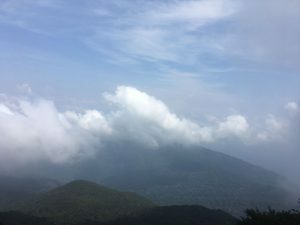 My Gunung Ledang Hike (4th August 2018) (by Stargazer) | JustRunLah! 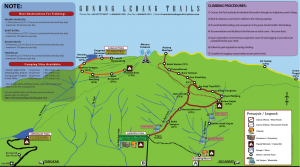 Gunung Ledang, or better known as Mount Ophir, is a mountain in the Gunung Ledang National Park located in Tangkak District, Johor, Malaysia. The summit is located between the border of Muar and Melacca. Standing at 1,276 m, it is the 64th highest mountain in Malaysia and the highest in the State of Johor. 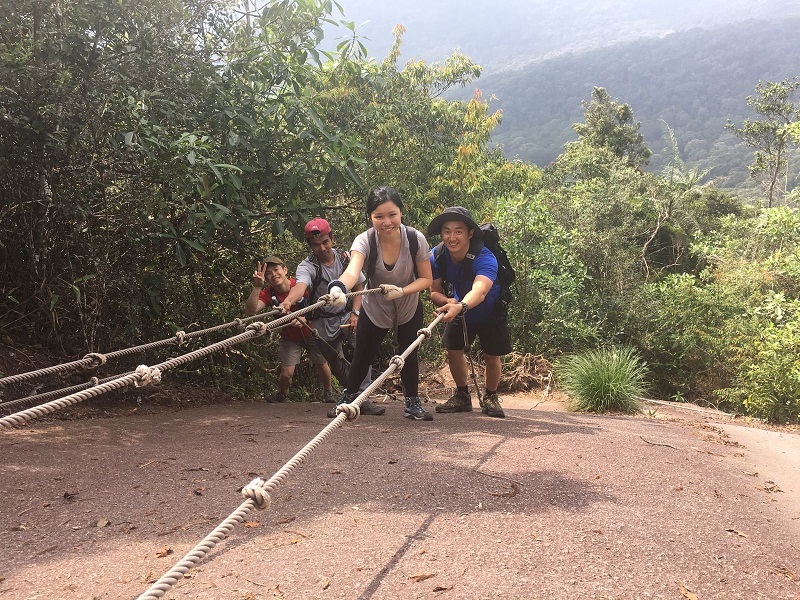 Mount Ophir is very popular with hikers but at the same time, is suitable only for those with a decent level of fitness. 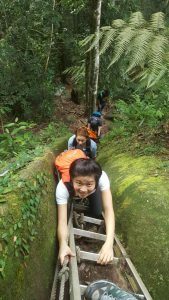 It is said to be the 6th technically challenging mountain to hike in Malaysia. I have done simple walks in some of the well-known trails in Singapore, such as the Changi Coastal Walk, Southern Ridges and Coney Island. I have also participated in races in Bukit Timah and Macritchie. Thus, I thought it is time to try something different, and I have always wanted to ‘climb’ a mountain. Hence, Mount Ophir came to my mind due to its popularity. At that moment, I did not have the slightest idea it could be challenging, apart from knowing there will be use of ladders and ropes along the way to reach the summit. I signed up with one of the organizer in ‘Meetup’. If you love the outdoors, this is one site you can find different groups advocating various activities, such as hiking, running, cycling etc. 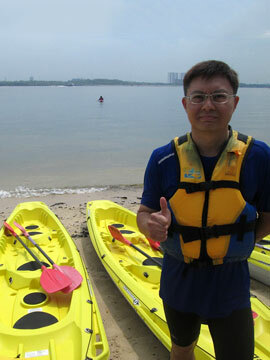 Participation in some of these activities, if held in Singapore, are mostly free. The trip included a 2-way transportation and a dinner on the way back to Singapore. It was a one-day trip and a total of 41 persons registered for this event. I had actually never hiked before. So I did preparation base on the advice shared by the organizer, what I saw in You Tube videos and of course, from my past race experiences. It is always wise to hike with a light load. So I decided to bring only the following items into the mountain : a 500 ml bottle filled, poncho, tissues and a pair of gloves. It would be good to wear hiking shoes, but I decided to wear my trusted North Face Vertical Ultra which I wore for The Force of Nature Ultra Race. I decided to put on some of my races tees. But I did purchase a running long pants, against a hiking pants, as I feel it is more comfortable and suitable in our tropical climate. I decided not to use the trekking poles. I changed my mind about this by the end of the hike. I did not specifically do training prior the hiking. I believe my consistent running and circuit training regime should be sufficient. The participants gathered at the Marsiling MRT at 11.35 pm. Attendance were taken and our 44 seater coach arrived at 11.45 pm to commence our journey to Mt Ophir. It was 3rd August, Friday, and there wasn’t much of a queue at the Singapore and Malaysia customs at midnight. We caught some sleep before reaching Yong Peng rest stop after 2.5 hrs of travel. Most stalls at the canteen were closed. Some of us had light refreshments before we continued on our way. We reached Tangkak Town at 5.00 am. Tangkak Town is very near to Mt Ophir and normally, visitors will visit this town before going to Mt Ophir. Most shops, except for 2 coffee shops, were still closed in the early morning. 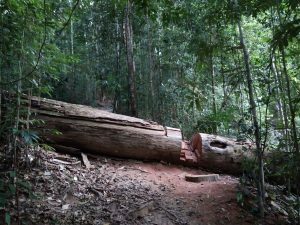 One seasoned hiker shared that this was the usual place for hikers to makan and tabao, as no food is sold at the Gunung Ledang National Park. We took our breakfast and at the same time, package lunch to be consume at the summit. We reached Gunung Ledang National Park at 6.45 am. The air was exceedingly cool! We changed into our hiking attire and filled up a ‘item declaration form’. Hikers have to declare the personal items that he or she is carrying up the mountain. After the climb, the national park officer will check the items that the hikers bring down to ensure that nothing (no trash) is left in the mountain. A total of 4 guides were assigned to our group. A chief guide will lead the way, while another 2 will stay with the main body and a sweeper guide will trail with the last of the hikers to ensure no one was left behind. The chief guide held a safety briefing with us and described to us the routes which we will be taking to the summit. 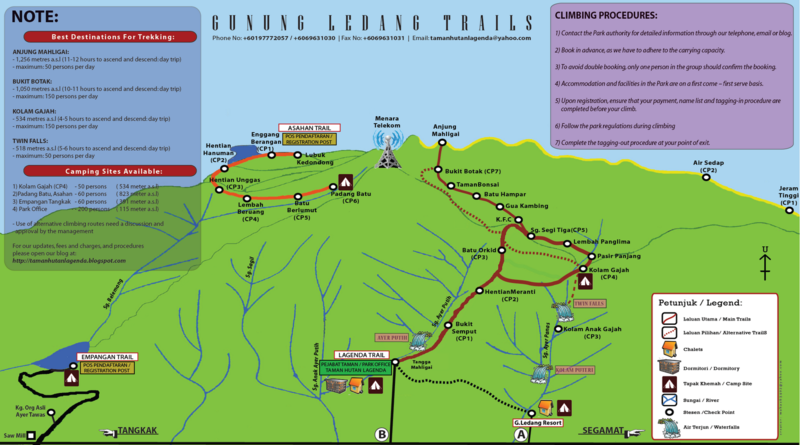 There are basically 2 main trails leading up to the summit; the Lagenda Trail and the Asahan Trail. We would be hiking via the Lagenda Trail, which is more popular (challenging as well) and consisted of 7 check points (CP). The first part of the climb is a long flight of concrete steps (400+) leading from the Park. The terrain is quite treacherous, with protruding tree roots and rather steep ascensions at some regions. There were huge boulders and we had to at times, climbed over fallen logs. I didn’t feel hot in the jungle as the tall trees had blocked out the heat from the scorching sun. I did perspire profusely though, which I thought was only normal. It took me nearly 2 hrs to hike to CP 5. We had bypassed CP 4, which is not along the main trail to the summit and it is a site allocated for camping activities. After CP 5, it is the start of the infamous ‘KFC’. KFC stands for ‘Killer for Climbers or Killing Fitness Centre’ (not Kentucky Fried Chicken), where we were expected to scale, at some point, using ladders and ropes. 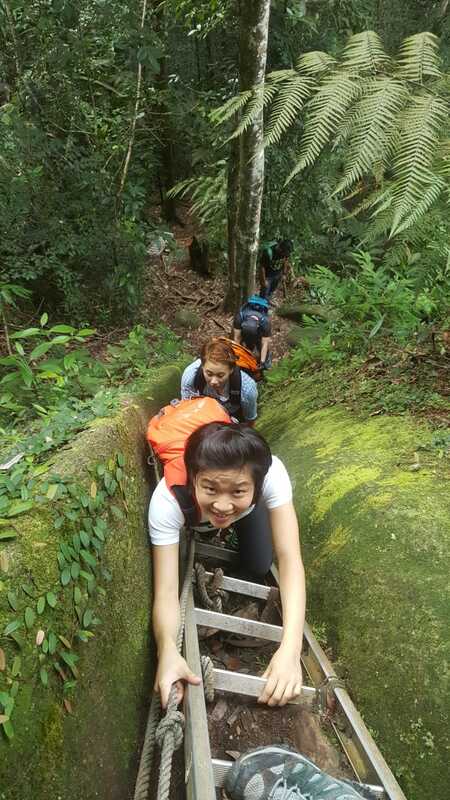 One reason I had opted to climb Mt Ophir was actually because of the mandatory use of ladders and ropes. I did not want a pure ‘walking-only’ experience. I knew it would be fun amid challenging especially after getting tired from all the uphill hiking. But I guess this was not an issue, as we watched out and encouraged one another not to give up. Halfway between CP 6 and CP 7, I suffered severe muscle cramps on my thighs. I had difficulty moving even an inch, and had to rest a while to massage away the cramp. After some time, I felt better to continue my way and overcome the remaining ladders. I finally reached a clearing and saw the summit within sight. It was quite misty but the surrounding view was beautiful. I reached the summit at approx. 12 noon. It had taken me 4.5 hrs to reach the top. Tired that I was, I took out and consumed my packet lunch. We took some rest, before starting the descent half an hour later. The descent from the summit was via another route and bypassed the dreaded ‘KFC’. The terrain was rockier compared to the way up and at some points, the trails were narrow just like what we have here in Macritchie. Scores of hikers were going up the summit through this route. My guide said this is the ‘short-cut’ route where some hikers choose, because they may not have the time or ability to overcome the KFC but nevertheless want to reach the summit. I like the trail etiquette here, whereby up-coming hikers will automatically stop and allow down-going hikers the passage of way. And when doing so, we gave each other words of encouragement to complete our hikes. It definitely wasn’t easy hiking down either. The terrain is steep and it was taxing on the knees. Many times, I had to grab hold of small trees to slow or even stop my descent momentum. The return journey seemed endless. It took me 2.5 hrs to reach CP 3. From CP 3, I re-traced downwards the same paths I took when ascending up the mountain. There were passing showers in the jungle, but I didn’t quite feel the rain drops as they had been blocked by the surrounding trees. It was another hour before I finally reached CP 1. It was indeed a welcoming sight when I saw the initial concrete steps leading to the National Park. I took time to detour to the nearby water fall before heading back to the Park. I bought an F&N to quench my thirst and oh my, it never tasted so good! I proceed to ‘check off’ my items with the park officer. Thereafter, I rested a while before going for a well-deserved shower. 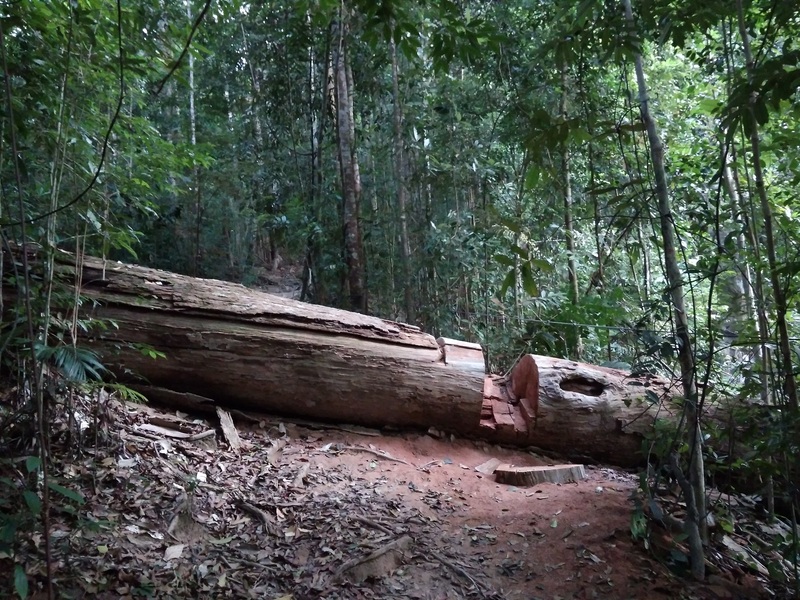 It was almost 6 pm when we left Gunung Ledang National Park after the last hiker returned. Most of us caught some sleep, tired from at least 8 hrs of hiking. We reached Yong Peng Town after an hour for a sumptuous 8 course dinner. It was certainly great to end the day with good food! We reached Malaysia customs by 10 pm. It was very crowded, with queues snaking all the way outside the main hall. It took us more than 1 hour to clear customs before continuing our way to the Singapore customs. Clearing the Singapore customs was comparatively fast. Our coach reached Marsiling MRT at 11.30 pm. I took taxi home, with a tired body but mind full of pleasant memories of the Gunung Ledang trip! 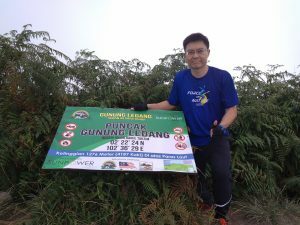 I do agree with the general views that Gunung Ledang is not suitable for first time hikers, unless he or she has been exercising regularly or with certain level of fitness. Also on hindsight, I could have used trekking poles. This would have made the climb easier with lesser stress to my legs. I would also have appreciated a ‘Certificate of Achievement’ after successfully completing the hike. It was not easy conquering the 6th most challenging mountain in Malaysia! Overall, it was a very good hike which all keen hikers should try at least once! Many good tips for would be hikers. Good to hear that you all came back safely. I am a 70+ retired soldier and jog up to 8 km at least 4 times a week. I had climbed mountain ranges in this range in height during my training days 40 years ago. I am wondering if you can advice me whether I can do this hike? Thanks. I was told that first time hikers should not attempt Ophir. But I am a first time hiker and I was confident of completing it because I had been doing runs and circuit training. I do think you are at advantage since you were ex military personnel and have been running all these while. And if you have been doing vertical runs, it would be even more beneficial as climbing mountain is like walking up staircases and slopes. As for age factor, there were hikers in my group who were 60+. Though may be slower in terms of hiking pace but nevertheless completed the hike. But do not underestimate Ophir even though it stands at just 1276 m. It is technically tougher than Kinabalu. So I would caution you need to carefully assess your health condition before attempting it.